Bulgaria has suspended plans for the South Stream Gas line to feed the Euro pipelines because of the invasion of Crimea. Bulgaria's Prime Minister Plamen Orešarski ordered to suspend work on the project on construction of a gas pipeline South stream, for consultations with the European Commission. The South Stream pipeline is being built to supply Russian gas to southern and Central Europe, bypassing Ukraine. The European Commission believes that bilateral treaties with European countries transiting-Austria, Bulgaria, Hungary and Slovenia-which violate EU law, reported in the Sunday edition of the novinite.bg. In early June, the EC proposed to suspend the construction of the South stream gas pipeline as long as it does not conform to the standards of the third ènergopaketa. "There is a request from the European Commission, and we stop further work on the project associated with this request, and depending on consultations with Brussels, a decision will be taken," the Edition quotes the words of the Prime Minister. Such a statement he made after meeting with a delegation of American senators, among them was Republican John McCain. U.s. Senators visited Bulgaria this weekend as part of a tour of Eastern Europe. Previously the official representative of the EC reported that the European Commission sent Bulgaria notification of non-compliance with EU standards in the competition to choose a builder and operator of the Bulgarian section of the pipeline. Read alsoThe European Commission insists on revising the agreement on the "South stream"
UNIAN reports, previously a member of the European Commission for energy Günther Oettinger stated that the draft of the South stream gas pipeline did not move, while Russia will not change its course on the political crisis in Ukraine. "We will restore the talks when the Russian partner will abide by international law and is ready for constructive cooperation on the basis of our energy legislation," said Ettinger. According to him, "with almost a civil war in the East of Ukraine and that Moscow does not recognize the Government in Kiev, we will surely not to come in our negotiations." In April, the media reported that Bulgaria had refused the Russian gas pipeline bypassing Ukraine. Building a deep sea pipeline is a very expensive operation. It's much cheaper to build one overland or at least in shallow coastal waters with monitor and pumping stations on nearby dry land. Look at the picture in the above post and see what land has been recently "acquired" by Russia. It is obvious that the invasion of Crimea didn't just happen. Stealing the off shore gas fields along with Crimea is a bonus to the thieving Russian government and their minions. Another option for a gas line is totally overland from South East Ukraine along the coastal area thru Odessa. But the locals screwed up that plan by kicking the Russian terrorists out. Awww shucks,, Too bad Boris! Bulgarian authorities soon tried to row back on Sunday's announcement, with the Energy Minister Dragomir Stoynev saying on Monday that the project cannot be cancelled and that it will be completed sooner or later. Serbia ? the next leg of the pipeline ? said it will still suspend the project until the construction of Bulgaria's section is sorted out. Last week, Ukraine's Prime Minister Arseniy Yatsenyuk said the country's state-controlled gas company, Naftogaz, would be split into three separate businesses ? one to manage Ukraine's pipeline infrastructure, one to oversee gas transport, and another to take charge of storage. Once split, Ukraine's gas transportation system would be modernized with the help of European and U.S. investors, Yatsenyuk said. And the main value of Ukraine's gas transportation system is that it can transport Russian gas, according to Pikin. If South Stream is completed, this value ? and Yatsenyuk's plans ? will be greatly diminished. Russia is still, and will stay a second world economy. Lesson for Putin, when you invade a country, you invade a country with everything you got. I bet Bulgaria would never do this to the Gringos. 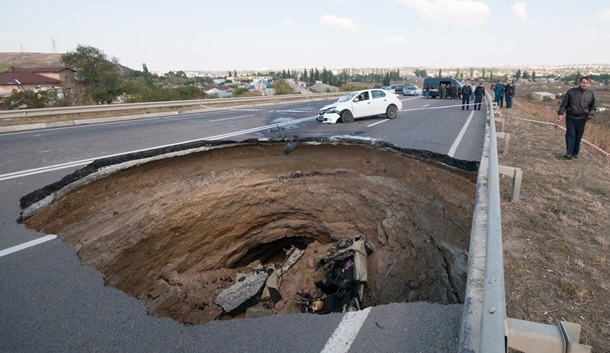 A few potholes to dodge on your cruise thru new russia. New low for the Russian Ruble. The pot is slowly coming to the boil.The sanctions need to be really ramped up now-- become extremely restrictive and focus on everything and anyone Russian anywhere.It also ought to apply to previous Russian citizens that have already fled-- those whose wealth was or is being gained in Russia.The pressure being applied is already causing a rethink in Russia from somewhat needs to be a tidal wave. As we have all seen on the forum -- a few closed minds that are incapable of thinking Thur a series of actions and the net result( which is obvious enough to 97% of people) can cause a lot of noise-- in Russia that large majority need to make themselves heard. That will encourage those that are in the position to have the means to change Russia's direction can be encouraged to get it done. Every bit of time that Ukraine can buy now is crucial-not only militarily but politically outside of Ukraine. Putin needs a major military victory in Ukraine to be able to maintain the credibility of his campaign-look for a much escalated attack very soon. For those pro-Rus posters who have shown zero empathy for Ukrainians plight and so little understanding of what a huge risk for Russia that Putin has taken -- keep watching--the chickens will come home to roost-- for Ukraine! Me-- not only would I reclaim every millimetre of Ukrainian soil--I would lay claim to the historic areas of the Kievan-Rus empire !! Also on my agenda would be monetary compensation to Ukraine-to every business that has lost money as a result of Putins stupidity. For those who have posted on Russian cash reserves-- how do you think they will look after paying compensation to Ukraine? Russia’s wheels of power are grinding to a halt. That's the assessment of five officials close to President Vladimir Putin, who say that a struggle at the heart of his inner circle is slowing decision making as sanctions squeeze the economy. With Putin focused on foreign policy, rival factions are battling for influence, said the people, who declined to be identified discussing internal issues, Censor.NET reports, citing Bloomberg. One group, centered on Prime Minister Dmitry Medvedev, is concerned about Russia's increasing alienation from the global financial system, said the officials. The other, which includes heads of state companies such as Igor Sechin of OAO Rosneft (ROSN) and veterans of the security services, favors greater state control over the economy, they said. Russia's ruling elite is convulsing as the economy careens toward recession, the ruble hovers near a record low and the conflict in Ukraine pushes the country deeper into a standoff with the U.S and its allies. With oil, Russia's largest export, at a 27-month low and banks increasingly turning to the state for funding, there's less money to go around. "The long-running conflict between rival pro-Putin camps has elevated to war," said Stanislav Belkovsky, a Kremlin adviser during Putin's first term who heads Moscow's Institute for National Strategy. "The elite are fighting for a shrinking pool of assets." Heightening the feud between the rival groups is the arrest of billionaire Vladimir Evtushenkov and the legal campaign by prosecutors to nationalize his oil company, OAO Bashneft (BANE), according to the officials. Evtushenkov, confined to his Moscow mansion since Sept. 16 on allegations of money laundering, is closely aligned with Medvedev and his allies, according to the people. They are at odds with the "siloviki," a group of powerful policymakers that includes men like Putin's chief of staff, Sergei Ivanov, who share a security service background and have worked with the president for decades. Evtushenkov's legal troubles show how damaging the conflict within the power structure can be for the losing side, said Olga Kryshtanovskaya, a sociologist studying the country's elite at the Russian Academy of Sciences. His fortune has tumbled more than 70 percent since the start of the year to $2.9 billion, according to the Bloomberg Billionaires Index. "State corporations are on the offensive against private business," Kryshtanovskaya said. "There is a deficit of resources. They need resources and Putin needs loyalty and controllability." Officials, already divided over Ukraine, are now keeping their heads down, waiting to see how the case against Evtushenkov plays out and who might be next, the people said. In ancient times, you can leave the conquered territory as it was, move your capital to the conquered territory or destroy it. Is Putin in charge anymore? Medvedev Admits That Sanctions Do Impact Russian Economy: "The Situation Is Very Complicated"
Some serious storm clouds brewing on the economics front for Russia according to this article. Putin can't accept that the Soviet Union is gone. We have had it up to here with the Soviet Union. 2 Billiion USD$ spent yesterday by Russia attempting to stem the collapse and prop up the "rubble"
How are all those ridiculous justify anything russian no thinkers doing now> ? Russia has less GDP than Italy and has largely one dimensional economy -- not exactly a prescription for the longevity of prosperity. when Bill Browder comes back to Russia, it will be safe to invest in Russia again. The head of Russia's largest bank, Sberbank, Herman Gref, himself a former economy minister, warned that Russia could end up collapsing like the Soviet Union. Some senior Russian officials have sounded increasingly dire warnings over the country's perilous economic situation but President Vladimir Putin has shown little sign of relenting over Ukraine in a bid to ease the economic woe. Economy Minister Alexei Ulyukayev last week warned that the combination of high inflation and feeble growth created an "explosive situation." Russia's already battered economy will struggle to recover from the fallout of the crisis in Ukraine as uncertainty looks set to drag down growth around the former Soviet Union, the IMF warned on Oct. 7. 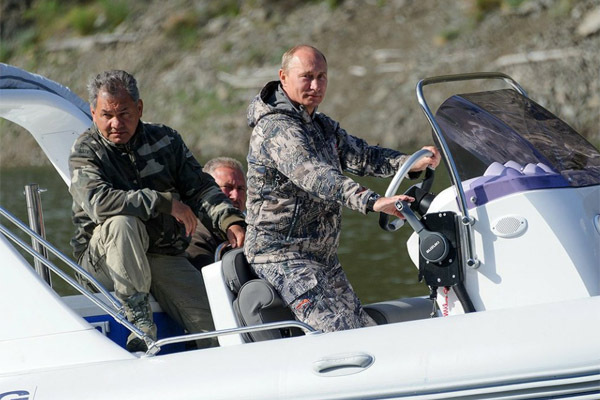 Russian President Vladimir Putin celebrated his 62nd birthday Tuesday in a peculiar fashion: by himself in the Siberian forests. For the past few days, Putin's spokesman, Dmitri Peskov, has brushed off journalists' questions about why the president decided not to celebrate his birthday in Moscow or do other work as he has in previous years. This is just another odd piece to an increasingly complex puzzle surrounding the stability and future of the Russian president and his government. Russia is in the eye of the perfect storm. Though the crisis with Ukraine has been reduced to a simmer, Russia has seen a strategic reversal in its critical borderland. In addition, the crisis moved the West to enact sanctions on Russia and loosen many financial and economic ties to the country. Now the Kremlin is in the midst of an economic crisis that is every bit as serious as the Ukraine situation. In the past two days, Russia's central bank used $1.6 billion of its currency reserves to shore up the Russian ruble. Since the start of 2014, the central bank has injected $51 billion in currency reserves to keep the currency stable. The Russian economy is projecting flat growth for 2014, while foreign investment into Russia has fallen by 50 percent. The Kremlin may have $630 billion in its reserves, but these funds are being used quickly in an attempt to fill the cracks. Concerns over Russia's financial stability have erupted into public battles between the various Kremlin factions. On Tuesday, Russian Finance Minister Anton Siluanov, a key figure in the liberal economic clans, publicly called on Putin to cut Russia's ambitious defense spending program. Russia is set to start a 10-year, $770 billion defense rearmament program in 2015. Siluanov reportedly rejected the plan during recent budget drafts in September, prompting Putin to move decision-making on defense spending under his office and away from the Cabinet. While Siluanov's argument against defense spending is financial, Putin also has to consider the security and political ramifications of such a decision. Russia's continued struggles in its borderlands will require a robust military. Moreover, Putin is using the defense budget to appease Russia's various security and defense circles. Though Putin has ruled Russia for 15 years in a centralized and autocratic fashion, like any other leader he must balance various factions within the country. His ability to manipulate the various political clans is what brought him to power. The lack of that ability is what caused the downfall of Boris Yeltsin in the 1990s, and many leaders before him. Yeltsin was unable to manage the competition between his own loyalists, the more liberal circles of economists and the security and defense circles. Yeltsin wildly shifted policies in order to retain a grip on power, such as his economic shock policies and the restructuring of the Federal Security Services. Such erratic moves contributed to the Russian economic crash, the breakdown of the security services and the erosion of Russia's military as it fought a savage war in the North Caucasus. Yeltsin's stumbling enabled Putin's rise to power. Putin understood that a Russian leader could rule only as long as he could balance the competing groups. Putin is a former KGB agent, tying him into the security circles, while his knowledge of Russia's need for Western technologies gives him an understanding of the more liberal economists. In his first years in power, Putin divided Russia's assets and tools of power between the clans, keeping them in constant competition and positioning himself as the ultimate arbitrator. The problem now is that the clan system has begun to crumble. The security circles are being blamed for failures in Ukraine, while the liberal economic circles are being blamed for the sour economy. Many personalities and groups are putting their own positions (and financial revenues) before the betterment of the state. Putin continues to try to maintain balance, as seen in the recent weeks of budget debates between the liberals and security circles. But Putin's 15 years of success at balancing the clans came during times of rebuilding and resurging for Russia. Now, Putin is attempting to find balance from a position of weakness. Putin's grasp on power is not easy to gauge from outside the Kremlin. The decision for new leadership is made within the Kremlin walls, not among the people. Previous Russian leaders, from Nikita Khrushchev to Leonid Brezhnev to Yeltsin, were removed or pushed aside by the ones closest to them. Thus, it seems fitting that the current Russian leader chose to celebrate his birthday far from the Kremlin and its clans. She is lying and she knows it. Russia is not interested in Ukrainian conflict. All these sanctions were very well predictable. Destabilization of Ukraine benefits somebody else. We know who this "else" is. This video is a pure staged 300% BS. Thus, it seems fitting that the current Russian leader chose to celebrate his birthday far from the Kremlin and its clans. I don't that this is the reason. Putin is not the person to celebrate his birthday officially. He has always been this way. We made such pictures in Hollywood. Its called make believe Doll. The pics are taken from official mass media. Although not along the lines of economic sanctions, geopolitical strategies or military tactics I consider this opinion piece describing the pre occupation by many Russian people idolizing Mr. Putin as more bad news for Russia as well. Oct 7th (Putin's Birthday) be celebrated as "Polite People's Day." 'Polite people' is the terminology Russian media uses to describe unmarked Russian soldiers sent in to disrupt areas before annexation/invasion. More commonly referred to as 'little green men' in western media. Giant books outlining his achievements. An Art Exhibit depicting Putin as the mythical Hercules defeating/overcoming various perceived foreign foes or challenges. My thoughts on it are dictator's are predisposed to believing their own propaganda. If history has shown us anything - populations creating/enabling an ultra nationalistic cultist type leader to lead their country doesn't usually end well for said country.